Treat your father on this special occasion by our pure ghee Laddu from Haldiram 1/2 Kg. (Gross Weight). with Roli Tilak and Chawal. 1/2 Kg (Gross Weight) Pure Ghee Laddu from Haldiram with Chanachur.Send this soft and hard to resist pure ghee laddoos from Haldiram to your loved ones. with Roli Tilak and Chawal. 1 Kg (Gross Weight) Pure Ghee Laddu from Haldiram.Send this soft and hard to resist pure ghee laddoos from Haldiram to your loved ones. with Roli Tilak and Chawal. 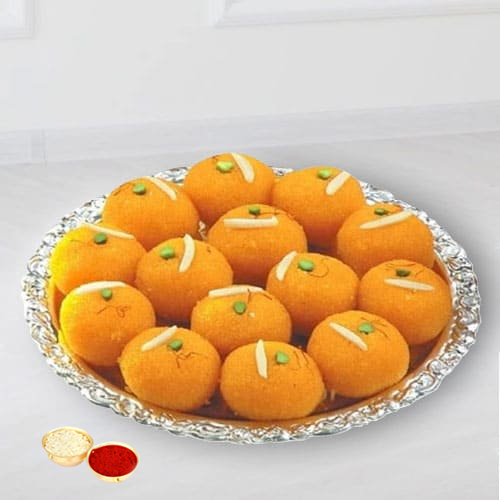 1 Kg (Gross Weight) Pure Ghee Laddu from Haldiram with Chanachur.Send this soft and hard to resist pure ghee laddoos from Haldiram to your loved ones. with Roli Tilak and Chawal.